This is a business of storytelling. 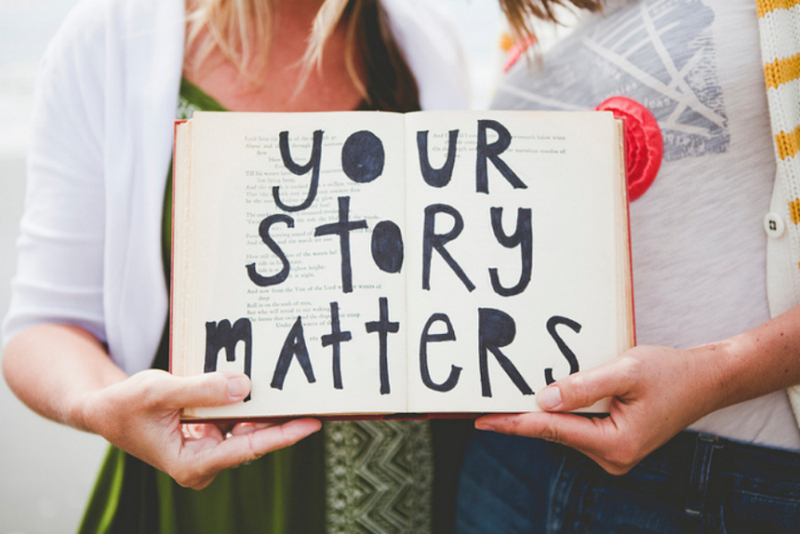 You do not need to be an expert on Juice Plus+ or our business, but you DO need to have a good story to tell! Your Story is your best walking/talking Juice Plus+ brochure; it’s your message. So, it’s important to be prepared when a conversation opens the door to introduce Juice Plus+. Your primary goal in your Virtual Franchise, every day, is to share your story as often as possible to open the door to Sharing Juice Plus+. Your Story needs to be clear and compelling, sparking the listener’s imagination, to see themselves in the story. Creating your Product and Business Stories are as simple as filling in the blanks on the worksheet below and memorizing them. For your Business Story, start with Experience, Share, Join; this should take about 15 seconds, then ask a question: “Have you heard of Juice Plus”?”. 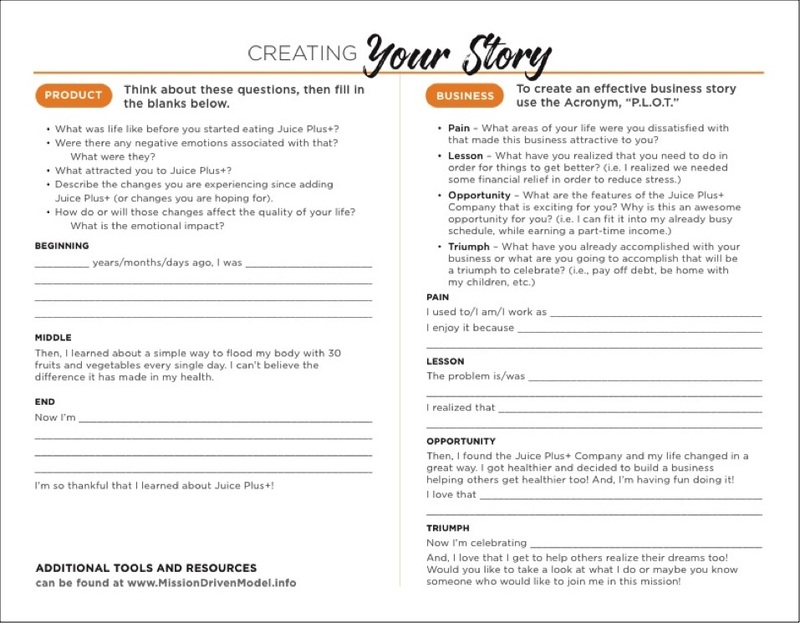 Now go deeper by using the Business Story P.L.O.T. outline below. Every great story has a ‘hero’, but the ‘hero’ in your story is not you; it’s not even Juice Plus+! Your initial goal is to help your prospect visualize themselves as the ‘hero’ of THEIR story. As you share your Story and Juice Plus+, make sure you are meeting THEIR interests, not YOURS! That’s spelled T.I.N.Y. Lastly, decide … which product meets their need and share that. If in a conversation it’s clear that the person has major financial concerns, it would be inappropriate to show them how to spend more money (on Juice Plus+). Rather, follow your heart and share your Business Story. “Can I share with you what I am doing to bring more money and health to my family?” As they listen, they will hear how great Juice Plus+ is, and if they decide to join your team, they and their family will benefit physically as they start to benefit financially. Help them visualize themselves in the story. Take the trouble to write your Story down, refine it, shorten it and make sure it covers the head and the heart reasons why you love Juice Plus+ and love what you do. They will remember your Story better than any facts about Juice Plus+. Follow your heart and express your heart: it’s not so much about choosing the right words, as choosing the right people; effective stories communicate heart to heart, not head to head. As we’ve been working with many of you to craft a powerful product story, we’ve often commented: “the story is good, but it lacks passion – or heart”. Make it heart-felt. You might want to add “Wow!” or “Oh my gosh!” to the beginning to give it that feeling of passion. Plan to share your Product Story twice a day at least. More of your friends and families will be inspired, and more of them will want to join you. Those who join your team will have already started Dreaming for themselves and will be better prepared to share their Why, as they start their Juice Plus+ Virtual Franchise. What Dream(s) will this business make come true for you? Make your Dream(s) the essential core of your story. Keep each answer brief, then you will develop a succinct story that should take no more than 60 seconds and that should leave a lasting impression. Armed with a compelling Business Story, your Memory Jogger of 50+ names (your ‘invitation list’) and your “Dream Team“, you will be off and running. Plan to share your Business Story daily, so you can invite 5 people every week to have a conversation with your mentor/coach about the business. Sit down with someone (eg. your coach, your sponsor) – in person or over the phone – and tell them the long version of your story; you can use the H.E.A.R.T. approach above, if it helps. Your coach will take notes and then you both work on bringing out the most important points in the right order, with the right emphasis … all in your own words, with tremendous enthusiasm. Armed with your compelling stories (Product and Business), share them every day, at every opportunity, with everyone you meet, and you will be successful. Ask your friends and family if you can practice on them! Continue to refine your story as you go. Remember – keep it short and full of heart. Our stories below will give you an idea of how HEART can really help you craft and deliver a powerful story with the right kind of impact on the listener. Let “20 seconds of boldness” open the door, then you share your heart-felt Story to visualize themselves as the ‘hero’ of THEIR story. “Juice Plus+? Oh my gosh! When I first heard about Juice Plus+, I was so skeptical I refused to take it. I mean, how could they possibly get all those fruits and vegetables into those little gelcaps? Ridiculous! But a few months later I took a closer look at it and, when I realized that it really was simply fruits and vegetables, I decided that it did make sense and that perhaps I needed it. As a family, we had always tried to eat well, but it’s not easy. So I was got started and I’m so glad that I did. I had a history of polyps on my colon and was told I was a high risk for colon cancer. Research suggests that a diet rich in raw fruits and vegetables, and high in fiber, reduces that risk significantly. I haven’t missed a single day of taking Juice Plus+ in over 20 years. In my late 60s, I take no medications, I have loads of energy, and I feel great! “Oh my gosh, I LOVE what I do! Working from home gives me the freedom to set my own hours and spend lots of time with our 6 grandchildren – my main purpose in this season of my life. I help people get healthy with the best nutritional product on the market today – Juice Plus+. The company makes it so simple, shipping Juice Plus+ directly to our customers. And they send us a very nice check every month. We get a great benefits package, including health insurance, dental, tuition program, holiday bonus. When I first heard about Juice Plus+ in 1993, I was intrigued!” I was a serious marathon runner and soccer player, who would never allow anything green on my plate … eat spinach? You have to be kidding! … after 3-4 months I noticed improved energy, stamina, and recovery time. Then I had incredible results in 2 marathons that I ran 6 weeks apart, my post-race recovery was phenomenal and I didn’t get sick (for the first time ever!) – I knew it was Juice Plus+! Over the years my problems with allergies, colds, chest infections and asthma have improved dramatically. Most of my life I was on antibiotics 3-4 times a year and I’ve needed them only 3 times in 25 years! Juice Plus+ simply restored my immune system and now we have scientific research to prove it! Even my taste buds have changed – now I love spinach and other greens, and I’m no longer addicted to chocolate, ice cream and steaks! My family and I will always take Juice Plus+, and now there’s so much published research on Juice Plus+ we have even more reason to take it, and to tell other people about it. “I’m proud to represent Juice Plus+: the most thoroughly researched nutritional product in history! After 23 years with IBM (mostly in technical support), the Juice Plus+ business really appealed to me. Helping people with their health and wealth is a lot more rewarding than dealing with computer problems all day long. Juice Plus+ dramatically improved my own health and fitness, so I felt compelled to tell people about it, and soon it became a serious business for me and my wife, allowing me to escape from the corporate world forever. Juice Plus+ has provided our sole source of income for over 18 years – and a substantial income it is! We’ve been full-time with this business, working from home, and over the years we’ve built an international business that has given us the time to travel, and the money to enjoy our freedom. We spent 4 years on the road as full-time RVers (at an age when most people are too young to have that kind of freedom), a year building our dream log home with our two sons in the Colorado Rockies, and also putting in volunteer time at our church. Now we live in a bigger second dream home very close to our sons, their wives and our 7 grandchildren. Our Dreams are bigger than ever, including seeing family and friends join us on this road to financial freedom.